Do you have one of these? 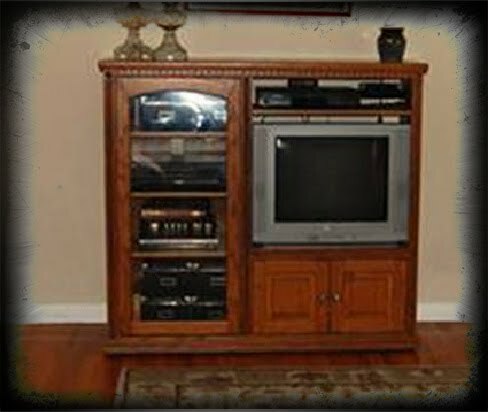 An oak entertainment center from the late 1990's? We do!! We also have matching bookcases, I remember being so excited about the set. Bob and I picked them out after we bought our first house, but now I'm pretty sure the unit is obsolete since TV's made today wouldn't fit in that square opening. Thinking 'green' and 'cheap', I scoured the internet for an idea to transform it into something else. Surprisingly there were no good DIY projects...so I had to go it alone. 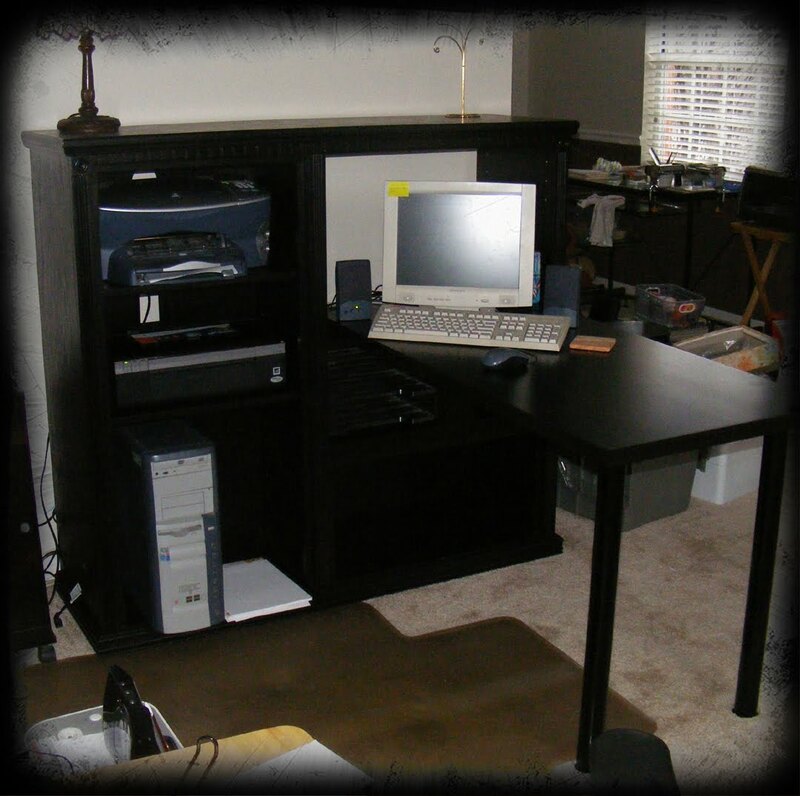 I knew the bookcases would get reused in the office, so I decided to turn this piece into a desk. I removed all the doors and hardware then got into changing the color. I really had my heart set on swapping the antique oak color for a stained black finish(though I'm sure in another 20 years I'll be priming to hide it..lol) If you curious, I used Minwax Polyshades in Classic Black Satin ($12) ... took 2 coats but wow that stuff is fantastic! I drilled four new holes at 29" and moved the shelf down that used to hold the DVD player. That shelf now supports the left hand side of an Ikea desk top ($20) . On the other side is 2 Ikea legs in black ( a whopping $3.50 a piece) ..and the magic is complete...green and cheap!! Now if I could just use magic to get all the clutter off the floor, then I could share a picture of the bookcases! WOWSER, I had to do a triple take to make sure this was the same piece. You did a fantastic job!!!! I can't wait to see this in person!! Yep, we have a very LARGE three-piece hand-built oak entertainment center from the 1990s. Our TV is one of those huge things so the hole for it is quite deep and wide. It takes up much of our living room and I've been wanting to do something else with it. Since it was handmade by a talented gentleman, I don't want to just chuck it. You've given me some ideas on how to repurpose it. I could use it for storage if and when I get my own studio. Love your transformation! It doesn't even look like the same piece! That is GREAT Angie- what a work, you have done- it looks fantastic in it`s new coat- and it is so functional,like that-looking very up to date,now. Presto chango indeed!! Awesome idea and execution Angie!